This is my 500th post. Now that is a milestone. When I started this blog in 2012 I really had no idea that I would be able to keep it going for this long. My principle intent was to create a record of the myriad models that I had found and restored. You see, I can't afford to keep every watch I restore but I feel like I put a little of myself in to every example. So in a nutshell, I can't afford to keep them but I find them very hard to part with. It's a conundrum and the blog has made it easier to let them go. Plus, I was afraid my wife would divorce me if she found out how many watches were in my collection and I was running out of hiding places! All told, there are 1,150 potential pre-1977 models and 126 are Electric or Electronic. That means there are over 500 mechanical models out there still left to be found. So I have a ways to go... "I have promises to keep, and miles to go before I sleep", as Robert Frost would say. 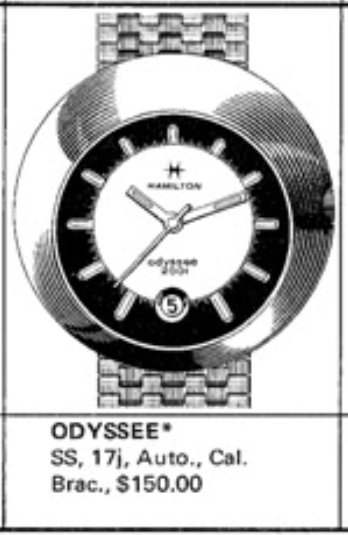 But this is a great milestone and what better way to celebrate such a long journey with Hamilton Chronicles than to mark it with a unique Hamilton model like the 1970 Odyssee? The Odyssee is a very interesting model. It was first introduced in 1969 after the Stanley Kubrick film, "2001: A Space Odyssey". I haven't seen documentation that the watch co-promoted the movie, but it's interesting that the watch has "2001" written on the dial. On the other hand, Odyssey is spelled Odyssee on the Hamilton though... go figure. There are actually two variants of the Odyssee. The first version from 1969 isn't shown in the catalogs but it's well known. The dial has circular hour markers and bold triangular-shaped luminous hands. It came on a mesh bracelet that looks a little like chainmail. The second version was introduced in 1970 and produced through 1973. The dial was changed to rectangular hour markers and the hands became luminous stick hands. The bracelet was also changed to a link-style design. The second version is more common than the earlier version, probably because the early version was only produced a single year. That doesn't mean its an easy model to find though, and they typically sell for a pretty penny ($600+). The Odyssee is an automatic calendar model and one of the few asymmetric automatics to boot. It can be found with either a 17 jewel 694A movement or a 21 jewel 64A movement. They are both based on the same ETA ebauche movement. The 64A has four extra jewels in the automatic mechanism. The Odyssee is also a part of the Fontainebleau line - of which there are quite a few unique and surprisingly popular models. 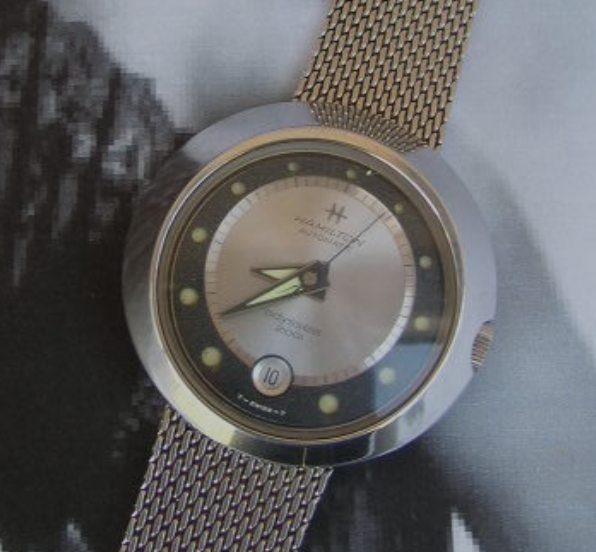 My Odyssee project watch is one of the latter version from the early 1970s. It doesn't appear to be running very well, the crown won't stay in and the crystal is deeply crazed. So it's need of a lot of TLC. Not only is the case wider at the top than it is at the bottom, it's also thicker at the top so that it's kind of a round wedge shape. The Fontainebleau model line typically have sandwich-style cases where the movement is held in between the crystal and the case back and it's all squeezed into the case. In order to open the case you need to turn the case back 90 degrees to release the back from the front - then everything drops out the back. They can be a pain to open and a bigger pain to close. Once the ring is removed, the case back with the movement comes out the back, along with the crystal and an o-ring. All of this is squished inside the case when it's tightened up. The movement and dial are contained inside the case back by a reflector ring. Once the ring is removed, the movement comes out the front, courtesy of a two-piece stem. In the shot below you can see one of the tabs on the back ring that engages the bezel. You don't really thread the ring back on, the ring gets tighter in the case as you turn it 90 degrees. This watch has the 64A movement and it's got quite a bit of corrosion and dirt inside. In fact, one of the dial foot screws at about 4 o'clock is rusted to the point that I can't see a slot for my screw driver. That means getting this dial off could be a challenge. Here you can see the inside of the case back along with a part of the reflector ring that holds the dial in place when its installed. There's a lot of grime inside this case back too. With the movement held in my movement holder, you can see that the dial is oblong-shaped and the movement is actually off-center. With the dial out of the way, you can see the date wheel is printed so the numbers are vertical at the 6 o'clock position. Sometimes the date wheel is printed so the numbers are vertical at the 3 o'clock position. It all depends on where the window in dial is located. Wow, this was a dirty movement - look how cloudy the cleaning solution got after about 6 minutes in the ultrasonic. You can barely see the parts inside. I forgot to take my usual photo of all the parts spread out after cleaning. In the shot below the movement has been partially reassembled and it's now running. However, if you look closely you might be able to see that I still need to install the balance jewels. It will run better once the jewels are installed and the shock spring closed. The balance jewel and cap end stone are tiny and great care has to be taken not to lose them when they're held by tweezers. It doesn't take much pressure to flick one of these into the ether - never to be seen again. The cap jewel has a flat side and a curved side and it makes a difference how its oriented. The flat side goes against the balance jewel. In the photo below, I've installed the two jewels and closed the Inca shock jewel. It's gratifying to see the motion of the balance improve when the lubricated jewels are installed. There is nothing wrong with this performance. The oscillating weight and the dial have to go back on before the movement can go into the case. The hardest part of this project is to find a replacement crystal. Its a very special design and they are scarcer than hen's teeth. The crystal is ever-so-slightly domed and it has a flange around the perimeter so it can be held in place inside the case. This one needs to be replaced as it's well beyond any potential improvement from polishing. This is what you're looking for, if you're in the market for a new Odyssee crystal. I had to replace the female side of the stem, thanks to the rust. That's why it wouldn't stay in place when installed before. My next step is to set the time until I see the date change. Then I can reinstall the hands at midnight. That way I know the date will change at the appropriate time. This watch doesn't have it's original bracelet so a new black lizard strap will have to do for now. The stainless steel case can really take a beating and this one shows that it has. The little flea bites between 12 and 1 are on the edge of the case, not the crystal. They can't be polished out. But that's not such a big deal and my camera makes it look worse than it really is. This Odyssee is now ready for 40 more years of wrist time. And just to satisfy your curiosity, here's a photo of the earlier Odyssee version, courtesy of a fellow collector, complete with it's original bracelet. Congrats on reaching 500! Like always, a pleasure to see and read your posts. Keep up the awesome work. And, the Odyssee turned out great. I found your work through looking for "cushion" models, and I've been reading ever since. You have a fascinating hobby, and it's a real pleasure seeing the watches get restored. Thanks for doing such a great, thorough job on my Odyssee. I have read that Hamilton produced some mock watches for the movie. They were similar, wedge shaped, to the Odyssee. People liked them so much Hamilton decided to produce an actual working watch. Congrats on your 500th post...and your intact marriage! Dan - Thanks for your wonderful postings. I am constantly referring to your work as I slowly learn about watches. I greatly appreciate all that you've done and look forward to the future. AND I keep an eye on your watches for sale. Congrats on 500, Dan! Keep up the awesome work! You know, I’ve seen the movie a few times, even recently on TCM but I must confess, I really just don’t understand it. Maybe there are two many things going on but most of them escape my grasp.